Infant mental health is an inter-disciplinary field of research, clinical practice and public policy-making concerned with maximizing the emotional, physical, social and cognitive well being of zero to five-year-old children and their caregivers. Knowledge about the principles and practices of infant mental health can be of real benefit to professionals and paraprofessionals who are involved with the care, development, treatment or education of young children, ages birth to five. This population includes hospital, office and public health nurses; midwives, physicians, social workers, teachers, health educators, child care providers, early childhood specialists, therapists of all descriptions – it is hard to think of any individual who is significantly involved with the healthy development of young children who could not benefit from training in infant mental health. 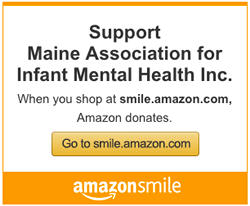 The Maine Association for Infant Mental Health — now approaching its 30th year — has recently updated and revised an introductory course in Infant Mental Health, suitable for any of the professional and occupational groups listed herein. Introduction to Infant Mental Health: Issues and Practice, a three-day, 18-hour program, is typically offered on two consecutive days of instruction and discussion, followed by a third day scheduled a few weeks later. The Association has found that this format provides the greatest opportunity for reviewing, strengthening and personalizing basic concepts and learning related to Infant Mental Health in relation to the specific backgrounds and service settings of individual participants. Experienced Maine clinicians, who developed the course in cooperation with the Association and have offered it many times to different audiences, serve as instructors. They utilize didactic presentations coupled with appropriate visual and print materials and small- and large-group work and discussion. They are equally skilled in addressing the needs of a specialized homogenous group or in presenting the course to a group with a broader, more varied base of experience. Discuss the importance of social connection to a young child’s development in all domains. Describe ways we can all work to support the parent/child connection. Discuss the degree to which our lives and history, as well as that of a family, can and do intrude on and/or support our work with families. Identify behavioral disturbances and possible barriers to attachment. Discuss family strengths and needs in order to support connection, relationship and to develop appropriate interventions. Identify the use of infant mental practices in your work. The course will provide specific information on attachments, temperament, relationship building, use of self, and principles of infant mental health practice, assessment, identification and support of family strengths. This course is available for a flat-rate fee of $3,600.00 to groups of up-to-20 individuals sponsored by a single organization or several collaborative organizations. In such cases, the organization(s) will be responsible for recruitment and registration, the provision of suitable classroom space and facilities, and any refreshments desired. Under this arrangement, the sponsoring organization(s) will be given the vitae of the current instructors who developed the course and will negotiate, as desired, with regard to the selection of one and the scheduling of the course. Alternatively, the Association on a regional basis may provide the course for up-to-20 “non-sponsored” individuals at an individual tuition cost of $250.00. In such cases, the Association will negotiate the selection of instructor and schedule, and will be responsible for registration, facilities and refreshments.